Over the last 4 years, I have joined a volunteer mission through my local Jewish Agency, Greater Metrowest Federation. Each year, we teach yoga for a week in a small community in the Negev, 13 Kilometers from the Gaza Border. As you can imagine, this community lives with ongoing threats to their safety. Rockets land in their fields and near their homes. They race for bomb shelters and safe rooms when the warning sirens begin to sound. There is a tremendous amount of loss as well. LifeForce Yoga has landed in remarkable ways in this community over the 4 years that I have taught there. It is an extremely powerful practice for addressing the immediate alarm reactions that so frequently occur, in children and adults alike. 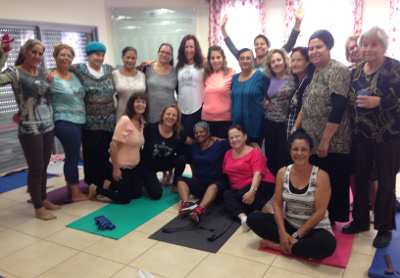 From the first year I taught LifeForce Yoga in the town of Ofakim, the response has been incredible. We worked to get a scholarship for a member of the community to come and train in LifeForce Yoga at Kripalu in 2015. Elisha Gringoled successfully completed the training, did his Mentoring with me, and was my Assistant at this workshop! As they say in Israel, “Kol Hakavod Elisha” (great job). The interest in LifeForce Yoga continued to expand and this year I was asked to create a workshop to teach local professionals dealing with mood and trauma to use practices in their daily work to help their clients, their families, and of course themselves. We put out a flyer to advertise the workshop, and within 3 days it was full! As with all my teaching in Israel, we have translators in each class…the English can range from very, very good to not any at all. This class was mixed. About 20 professionals attended my 5-hour workshop on LifeForce Yoga: Accessible Practices for Mood & Trauma. There were Child Advocacy Workers, Nurses, School Teachers, Social Workers and Trauma Center workers. Several of them worked and live on a Kibbutz that rests on the Gaza border…their homes and school are less than 1 Kilometer from the visible Hamas towers. This is also the area where the Israeli Defense Forces have located and destroyed at least 4 underground tunnels, dug underground by Hamas to enter Israeli territory for the purpose of terrorist attacks. What did I learn from these vibrant, courageous, inquisitive Israelis? 1- I see that even with chronic trauma, with sympathetic nervous system hyper-arousal, that the willingness and desire to bring forth intentional practices of LifeForce Yoga provides immediate relief and restoration of a parasympathetic response. Here’s an example. Two of the women in the class who lived on the Kibbutz I mentioned were receiving texts from their families DURING the workshop that the sirens were going off and that those at home had to seek shelter. A tunnel was discovered and bombed that day, killing a major Hamas Official. We were doing practices throughout the workshop to clear the space (Power Hara), balance the chakras (full LifeForce Yoga Chakra Clearing Meditation), grounding the energy with Mantra and more. By the time we completed Yoga Nidra, they expressed to me how different the day would have been if they had not been doing these practices. One woman said, “it was like there was nothing happening at home…the only thing was what we were doing in here.” They left with the intention to bring the practices home, and asked me to teach a workshop next year on their Kibbutz. 2- I see that even across cultural and religious practices very different from those in the U.S., that if these practices are “FELT” they can be accepted and if necessary, modified to fit absolutely anyone, under almost any circumstance. A young man in my class who works at a child Advocacy center for at- risk children asked, “so how do you get a Moroccan Religious (Orthodox Jewish) man like me to believe that yoga changes your mood?” A great question that I responded to with the suggestion to feel the practices first, and this was the best way to answer his own question. Of course, I also told him we would loop back toward to end to see what he experienced. I gave him permission to try what felt comfortable, but also to pass on anything he felt was a religious conflict for him. For some people, using Mantra (sound) can feel at odds with their religious beliefs. In all the years and the hundreds of students (children, teens, adults, soldiers) I have personally never had that voiced as a problem. I take care to explain what the sounds are and why they are used, and for most people this provides the comfort they need. I also invite them to change the Mantras to a similar-sounding word in their religion, such as using “Sh’ma” (Hebrew) instead of the Sanskrit, ShaMaYa. Anyway, we did Breath of Joy with Lum at the beginning of class, then inhaling to the crown with “I am” and grounding the energy with “here.” This young man asked to do that practice again with me, one-on- one after the class. As I watched the practice do its magic, I saw his face soften, his eyes relax and close, and then a huge smile lit up his face. He said to me, “wow, I just saw my daughter smiling at me…I can’t believe it.” He had the felt experience. He answered his own question. So the second part of this insight I share with you is that IT DOESN’T TAKE MUCH! Let people have their experience. It may not be the first one you try, but somewhere in that LifeForce Yoga toolbox, there is a practice that is accessible to everyone. *The one caveat I want to share that I became aware of teaching in this community is that when people are in active combat, on active police duty, or in a job where they need the life-saving responses of the sympathetic nervous system, we need to leave them alone. They need the fight-flight response to protect them, and the adrenaline and other neurotransmitters that literally are helping them NOW to survive. We might consider certain practices with them when they are off duty to help with anxiety, trauma, and loss but not during these active times. As always, I have deep gratitude to Amy for gifting me the beautiful practice of LifeForce Yoga. Thank you to Rose, to all of our wonderful Mentors and to my students who teach and support me to rise to my highest self, each and every day.